1982- The UVa Women win their second consecutive NCAA Cross Country Championship, having gone undefeated for two straight years! 1983-Cynthia Lorenzoni wins her second straight Marine Corps Marathon title! 1983- The Charlottesville Track Club hosts the inaugural running of The Charlottesville Women’s Four Miler (380 women participate). 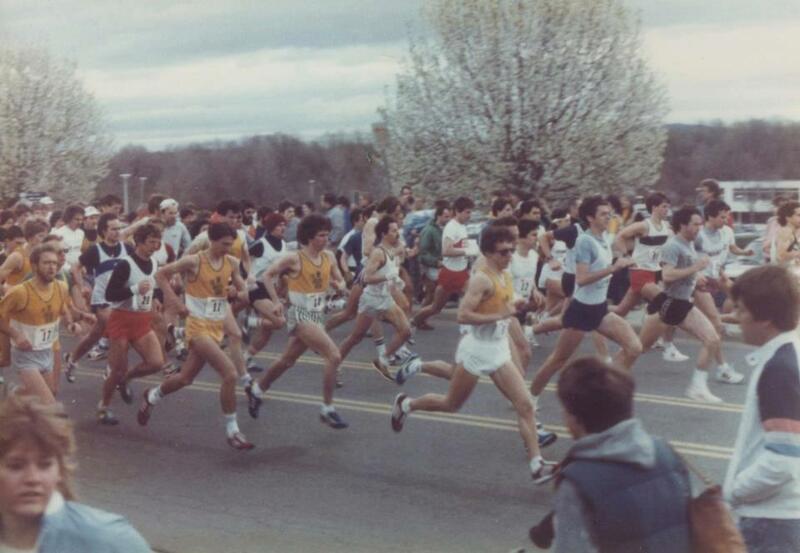 1984 - The area’s largest and oldest race, The Charlottesville Ten Miler, unveils a new city course. For the first time city streets are closed to auto traffic for a footrace! 1985- Charlottesville High School standout Doug Bloor becomes the last area harrier to break 16 minutes (15:59) on the legendary Piedmont cross country course (considered the most challenging course in the state)! 1986 - Fred Binggeli takes the reigns of the Cross Country and Track distance program at UVa. 1986 - The Louisa girls take home their first ever State Cross Country Championship! 1986 - UVa Sports Psychologist student Richard Ferguson becomes the first person to break 50 minutes at the Charlottesville Ten Miler and at the same time goes into the history books as the first and only male (Cynthia Lorenzoni is the only other person to have done so) to win the Ten Miler on both the old and new courses! 1987 - The University of Virginia hosts the NCAA Cross Country National Championships at the Foxfield Race course in late November. 1988 - UVa runner Paul Ereng wins the Gold medal (the first ever individual gold for a Cavalier athlete) in the 800 at the Summer Olympic Games in Seoul, South Korea. 1989 - Former UVa All-American and National Champion Margaret Groos wins the women’s division of The Charlottesville Ten Miler in 54:38 and finishes 8th overall, which is the highest place ever for female. Both records still stand. 1989 - The Charlottesville Ten Miler breaks the 1,000 entrant milestone! 1992-The Rivanna Trails Foundation (RTF) breaks ground on their first section of public path. Today that path loops the city, stretching close to twenty miles and features what many believe is the best urban soft surface trails system in the south! 1992-Bev Hayden becomes the CTC’s first female president! 1992-The Albemarle County Parks department opens a brand new x-country course at Towe Park. The course would eventually host dozens of harrier events, including the ACC Championships! 1993-Olympic Gold Medalist Joan Benoit Samuelson joins us for The Ten Miler. 1994-The Western Albemarle Girls X-Country team, under the able guidance of Cherie and Chuck Witt, win the school’s first ever State Championship in Blacksburg (The Witt’s squads would go on to win two more state x-country titles in the next three years)! 1995-Mark Lorenzoni and Dave Murphy call it a day after 12 years of directing The Charlottesville Ten Miler. 1996-UVa tracksters Ronde and Tiki Barber establish themselves as two of the fastest 100 meter sprinters in the ACC (they also played a little football while at Virginia)! 1996-The Olympic torch winds its way through the streets of Charlottesville en route to the Olympic Games in Atlanta. 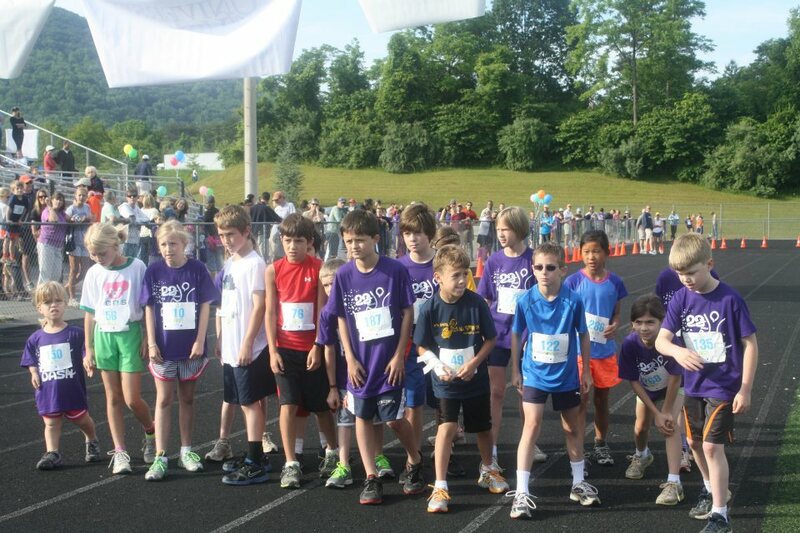 1998-The Charlottesville Track Club helps to organize and support its 500th charitable footrace. 1999-The Western Albemarle boys win their first x-country State Championship under the leadership of Lindy Bain at Great Meadows (they would return to win again the following autumn). 1999-Steve Murray and his family open their beautiful property, Panorama Farms, for a high school cross country race for the first time. 1999-Bobby Thiele and Jennifer Owens earn All-American honors, making them UVa’s only distance athletes of the decade to garner this prestigious honor. Both are “locals”, Bobby having competed for Charlottesville and Jennifer for Albemarle while in high school! 2000-The Discovery Dash, the state’s largest all-kids footrace, celebrates its 10th Anniversary, having hosted over 4,000 kids during that first decade. 2000-The Women’s Four Miler shatters the 1,000 mark for the first time, making it the largest all-women’s footrace in the state! 2001-The C-ville Tri-Club hosts the area’s first triathlon in a decade, as they kickoff a trio of events at beautiful Walnut Creek Park. 2001-The CTC celebrates 25 years of hosting its popular Summer All-Comers Track Meets. 2002-The area hosts its first ever Marathon and Half Marathon at Whitehall Vineyards. The event is now held in Downtown Charlottesville every spring. 2003-Dave Lasch, Carol Finch, Dave Murphy, Chip Hopper and The Rogols each enter their third decade of volunteering their valuable services at area footraces. Between them they have helped at over 1,500 non-profit races! 2003-Neil Rioux and Anne-Marie Miscovic become the first ever Ragged Mountain employees to tie the knot after first meeting while working at the shop! 2004-Cynthia Lorenzoni is the second woman to be inducted into the Marine Corps Marathon Hall of Fame. 2004- Under the guidance of former State Champion Carin Ward, the Western Albemarle Girls win their third consecutive State Cross Country title! 2004-The Charlottesville Women’s Four Miler breaks the 2,000 entrant mark for the first time ever! 2005-David Brown, a former CTC board member, becomes Charlottesville’s first marathoner Mayor. 2005-WINA radio celebrates 20 years of covering The Charlottesville Ten Miler live on race day and The Daily Progress prints the All-Central Virginia weekly Cross Country Poll for the 12th year. 2005-Alec Lorenzoni becomes the first child of a former Ten Miler champion to win the area’s oldest and most prestigious footrace (“Mom” Cynthia won the race back in 1981 and 1984). 2005-Under the leadership of Coach Jason Dunn, for the first time in school history, UVa qualifies both its men’s and women’s cross country squads in the same season for the NCAA National Championships! 2005-Covenant’s Austin Ellis and Albemarle’s Rachel Rose win their school’s first ever individual State Cross Country championship titles. 2005-The Charlottesville Women’s Four Miler becomes the first area race to donate $100,000 to an area non-profit (the Breast Care Center at UVa)! 2006-Legendary area coach Buz Male is inducted into the National High School Cross Country Hall of Fame. 2007-Under the steady guidance of Coach Curtis Elder and Coach Ron Greene, the Charlottesville High School girls win yet another State Track Championship! 2007-Fork Union Military Academy (FUMA), under the leadership of Coach Winston Brown, wins their 20th consecutive Prep League State Outdoor Track Championship.